French Emblems: Emblem: Iusta ultio. Juste vengence. Scorpion, audaci praemia parta gulae. Raptorem in stygias compulit ultor aquas. Ipse perit, propriis succubuitque dolis. 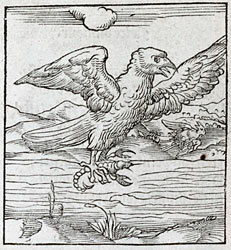 A raven was carrying off into the flying winds a scorpion gripped in its talons, a prize won for its audacious gullet. But the scorpion, injecting its poison drop by drop through the raven’s limbs, despatched the predator to the waters of the Styx and so took its revenge. What a laughable thing! The one who was preparing death for others himself perishes and has succumbed to his own wiles. Luy donnant de mort le danger. Ainsi a sceu son mal venger. Bien souvent les preneurs se preignent. 1. This is a fairly free translation of Anthologia graeca 9.339. See Erasmus, Adagia 58, Cornix scorpium, where the Greek epigram is again translated.